It’s the most wonderful time of the year — Black Friday Sale 2017! And to spread the cheer this holiday season, Bob’s is offering an incredible deal on all the luxury watches on our website. That’s right, everything from Rolex to Cartier, Breguet, Panerai and more. Black Friday is here! Take advantage of the sale. This year, we invite you to treat yourself to the timepiece of your dreams or spoil your loved one with a dazzling watch that will leave them speechless. On Friday the 24th, you will receive $100 off all orders of $2,000 or more, $200 off orders over $4,000, and $400 off orders over $15,000. But, the giving doesn’t stop there. This year, we’re also offering qualified customers the chance to finance their holiday watch purchase for 0% — because we believe when you’re this generous, you deserve a little something, too. To help you start planning for the big sale, we’ve listed some of our top-sellers so you can start making a list and checking it twice. Here is the Anniversary Rolex Submariner ref. 16610LV, a favorite among collectors. Celebrate the holidays right with this festive green Rolex Submariner Anniversary Edition 16610. Despite the holiday color, this emerald green accent will gracefully carry through the rest of the year beautifully — as it’s one of the most popular hues out there today. There’s something about that organic color that pops against the metallic band, isn’t there? Besides the stunning aesthetics like the green face, black dial, luminous hour markers and Oyster bracelet — this watch is outfitted with an Automatic 3135 movement, rotatable diver’s bezel, and scratch-resistant sapphire crystal. It’s a gift that’s sure to make someone smile for many years to come. The Datejust ref. 116333 is a watch perfect for any party. 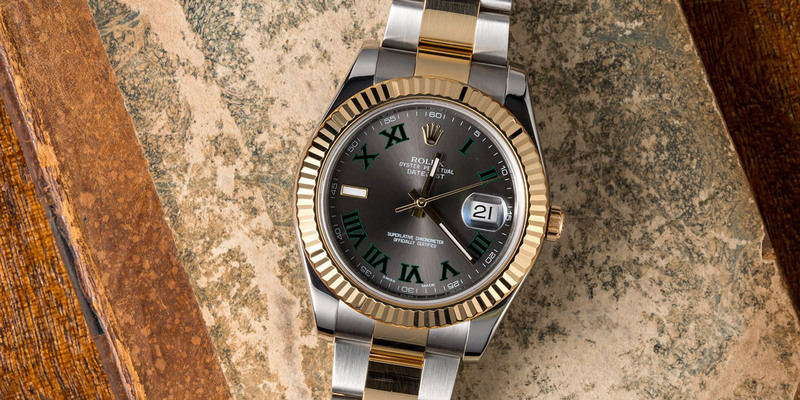 There’s nothing more timeless than a Rolex DateJust, making it one of the perfect gifts to give this holiday season. This here is one of the finest examples with a gold-framed face and gold accented stainless Oyster bracelet. The golden etched Arabic numerals shine against the black 41mm face, and of course, the date is illuminated by a sapphire crystal. This DateJust also comes with world-class features like an automatic 3136 movement and a waterproof case that will last the test of time. 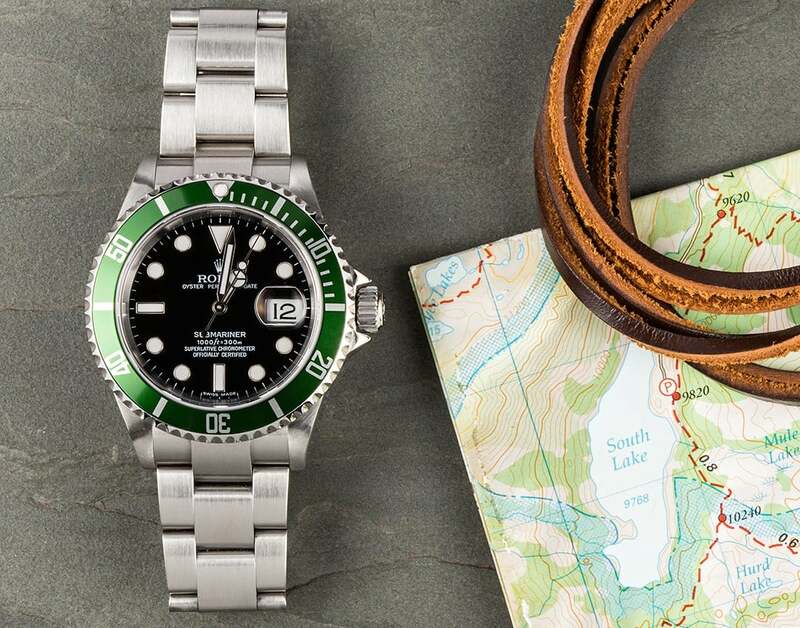 Here is a stainless steel Explorer, a watch made for those who love adventure. 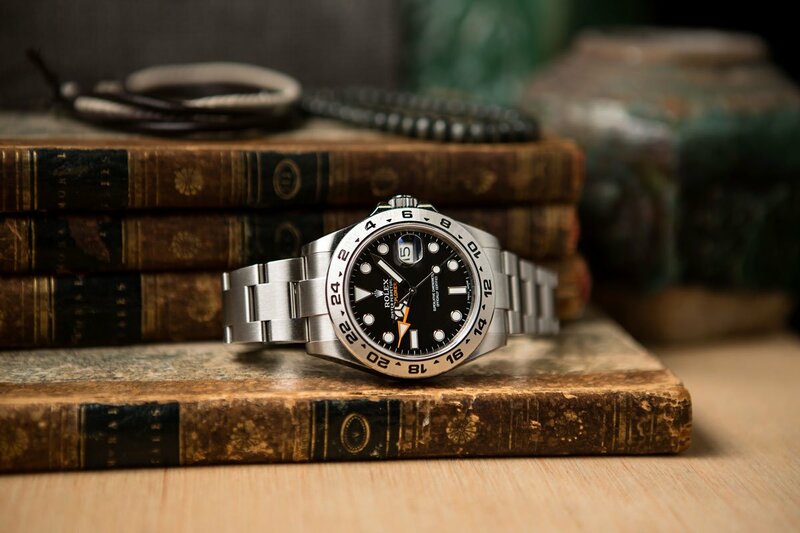 This Rolex is built for the sportsman of the family with an all-steel construction, waterproof screw-down crown and the ability to withstand extreme pressure and temperatures. Aptly named the explorer, this ref. number II 16570 is built to take its wearer from mountaintops to deep-sea scuba caves — and it will make you look good doing it, too. The 40mm Oyster case is also outfitted with a 24-hour bezel against a stunning black face with luminous hour markers. The look is masculine and without frills — instead, the feel of the watch and the quality of every single element are what makes this timepiece stand out. The modern explorer in your life is going to be very excited to gear up for their next adventure. The Batman is one of the hottest watches on the market. This watch is made for the avid traveler — durable, handsome and able to tell time over three time zones. 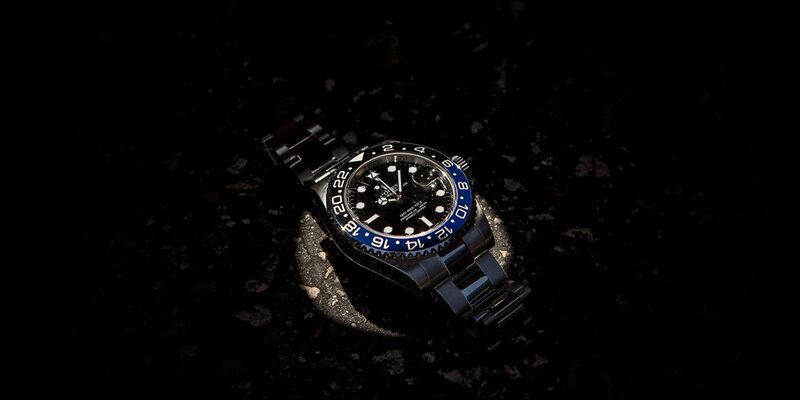 The Rolex GMT-Master II 116710 is just as stunning today as it was when it was introduced to the watch-world at Baselworld 2005, with a black maxi set dial accompanied by large, bright hour markers and wider hands. Surrounding it is a killer Cerachrom ceramic bezel that lets you tell time in 24-hour graduations and track up to three timezones at once. This modern watch was also updated with top of the line 903L stainless steel, a scratch-resistant sapphire crystal and an Oyster bracelet that showcases satin and high-polish folds. It might be tough handing this watch over to the traveler in your life, but, at least you’ll get to admire it from afar. The Daytona is an incredible timepiece for its ability to track time with exceptional accuracy. Of course, the Daytona is for the car enthusiast in your life. Although, you don’t have to be into race cars — or even sports cars for that matter — to appreciate the elegance and craftsmanship of this timepiece. This watch is named after the 24 hours of Daytona and is actually made for drivers by taking an emphasis on precision and endurance. 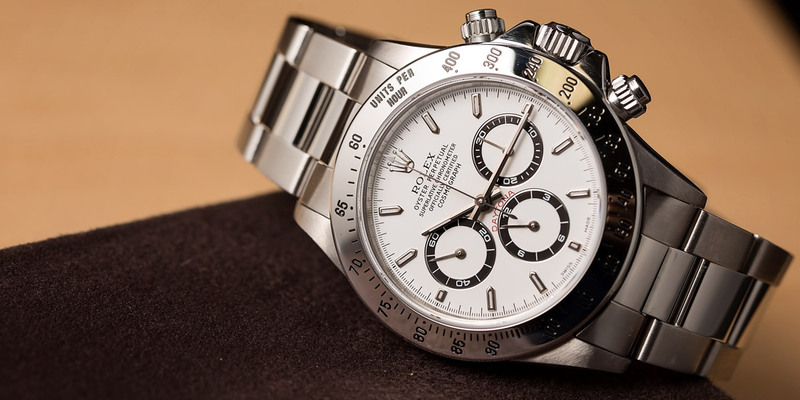 To do so, the Rolex Daytona 116520 was crafted with a 4130 perpetual movement with anti-shock technology. It can even measure driving speeds upwards of 250 miles per hour while the chronograph functions keep perfect time. Finally, it’d be a shame not to mention the bright white face of this watch with glowing hour markers — it absolutely pops against the durable stainless Oyster case and bracelet. Don’t stop your search there! 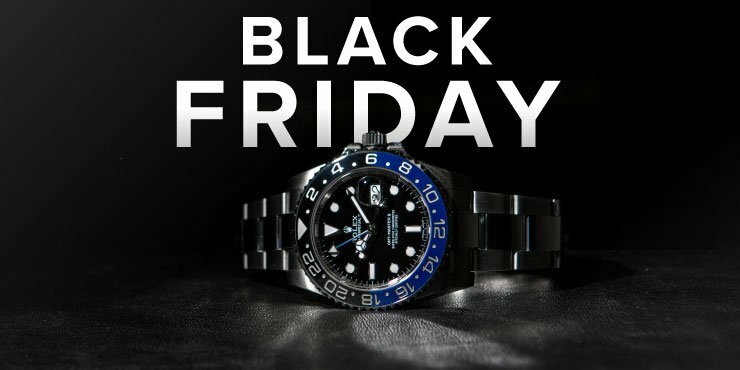 Our Black Friday sale starts now, so keep browsing our collection of luxury watches today. *Bob’s Watches 0% financing is subject to credit check and approval and is only valid until December 31, 2017. Rates from 0-30% APR based on creditworthiness. 0% offer is valid from November 23, 2017 through December 31, 2017 and is subject to change at any time.